We are looking for a candidate to fill the Microsoft Dynamics 365/AX Solution Architect for an award-winning fully focused Microsoft Dynamics 365 provider. Salary: Up to £120,000 p.a. Our client is seeking a Microsoft Dynamics 365 for Finance and Operations – SCM AX Solution Architect to join their award winning and growing team in the UK. This individual will collaborate with business analysts and other team members to determine the best design approach regarding the overall solution including system design, data integration and migration on Supply Chain Module projects. The SCM Solution Architect will be responsible for providing leadership and guidance across multiple projects, ensuring the use of our clients award-winning standards and best practices, cross-pollination of knowledge from previous/other solutions, and mentoring. The candidate must be extremely detail-oriented, have the ability to multitask, be meticulously organised, and be able to prioritise multiple demands in a fast-paced environment. Promote Best Practices: Must be able to provide proactive and reactive advice in an effort to ensure the best design and SCM solution across multiple projects. Be able to be involved in different levels of project processes and provide input wherever needed to enable projects to be successful. Evaluating and understanding business process and preparing a detailed Business requirement specification document [BRS]. Ability to analyse client requirements and objectives to determine how software can best meet clients’ requirement and objectives. 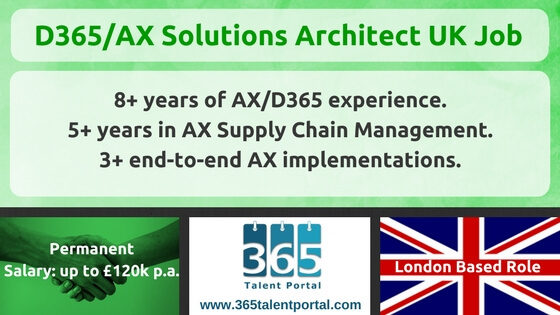 Functional consulting to design and develop AX solutions for clients on Supply chain module. Work closely with clients and other team members to define, design and align the business application to the business requirements. Configuring, Testing and Demo’ing Procurement and inventory management process in Dynamics 365. Handling SIT, End user training, UAT and Go Live. Managing and delivering small projects independently. Leading other consultants in delivering according to client expectations; take ownership of successful completion of deliverables and projects. Participating in the development of functional design documentation and technical specifications, unit and system test scripts, and deployment plans, perform SIT testing. Facilitating functional sessions and weekly status meetings with clients, including the ability to drive a client to decisions. Owning project deliverables (status reports, documentation, test plans.) Take personal ownership of the success of deliverables and projects. Conducting functional testing of modifications and sub-processes during sprints. Having extensive project delivery experience with Microsoft Dynamics AX/Dynamics 365 for Finance and Operations. This includes ERP system design, customisation, installation, deployment, architecture, and more. 8-12 years of Dynamics AX/Dynamics 365 for Finance and Operations functional experience. Minimum of 5 years of consulting experience in Supply chain management. Experience working on at least 3-4 end to end implementation projects and should be aware sure step implementation methodology. Aware of and worked on Key supply chain module areas like procurement cycle, inventory management including inventory closing process. Complete knowledge on various supply chain module Inquiry tools and reports. Should have good hands on experience on Dynamics AX 2012 and preferably experience with Dynamics 365 for Finance and Operations. Relevant procurement or SCM domain expertise.